LAS VEGAS, Nev. - Erik Karlsson feels he's a better player than when he won the Norris Trophy three years ago. But he credited the Ottawa Senators' improbable run to the playoffs for his second award. "This would have never happened if we didn't go on the unbelievable run that we did, and if we didn't have guys stepping up and playing the way they did," Karlsson said. "It wouldn't have allowed me to sit in the position I'm in today." Along with new coach Dave Cameron, goaltender Andrew Hammond and rookie Mark Stone, Karlsson led the Senators from the back of the pack to a wild-card spot in the Eastern Conference. With a career-high 21 goals to go along with 45 assists, Karlsson led all defencemen with 66 points. His offensive game is as strong as ever, but Ottawa's captain has improved his defensive game since winning the Norris in 2012. 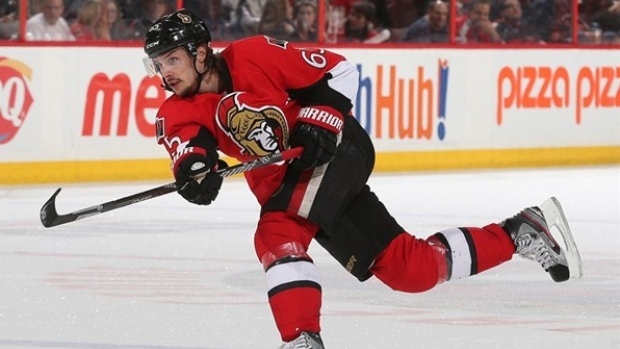 "I made improvements, but I think there is still a ways to go," Karlsson said. Karlsson finished ahead of Drew Doughty of the Los Angeles Kings and P.K. Subban of the Montreal Canadiens. In his acceptance speech, Karlsson paid tribute to late Senators assistant coach Mark Reeds and owner Eugene Melnyk and general manager Bryan Murray, who are battling illnesses. Karlsson is one of two active players to win the Norris twice, joining Duncan Keith of the Chicago Blackhawks.